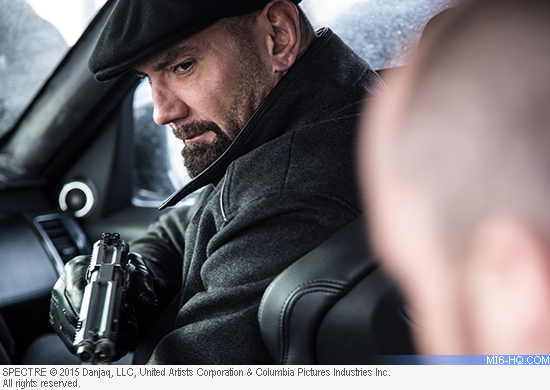 Dave Bautista has gone public with his desire to make a return in the next James Bond film. The America actor played the (almost) silent Mr. Hinx in the 2015 James Bond film 'SPECTRE', but the fate of the character was left a little open-ended when audiences saw him pulled from a speeding train in Morocco. Now, Bautista wants to make a little cinema history by being only the second major henchman to make a return in the 007 franchise. Richard Kiel is so far the only actor to have pulled off the feat, having made such a popular impression with audiences with his role as Jaws in 'The Spy Who Loved Me', producers brought him back for the follow-up film 'Moonraker'. Quizzed during his press junkets for his new film 'Final Score' (co-starring former James Bond actor Pierce Brosnan), Bautista addressed the possibility of bringing Mr. Hinx back for Bond 25: "We had hopes, and…they had mentioned it. But yeah still have kinda hopes…I hear it’s been pushed, so maybe there’s a…chance"
“Yeah I want to be in Bond 25. I’ve been very open and political about it. Like I’ve pursued this role. I would love to revive Hinx in Bond 25. I wanna be a part of it because it’s a historical film. There’s a huge part of me that wants the bragging rights of being that henchman who came back twice, because there hasn’t been many. And I wanna be that guy, I wanna be historical, y’know."